Jackson Guitars got their start with the creation of the Randy Rhoads Model by Grover Jackson, a partner of Wayne Charvel (Charvel Guitar Repair.) The brand "Jackson Guitars" was actually born simply because this model was feared to be too extreme for the Charvel market at the time. Eventually, the Charvel company would be sold to Jackson and Jackson would be sold to Fender. 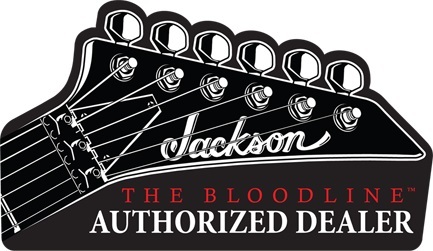 Throughout the years, a number of amazing guitarists have used Jackson Guitars, including Zakk Wylde (Ozzy Osbourne and Black Label Society), Chris Beattie (Hatebreed), Serj Tankian (System of a Down), Matt Tuck (Bullet For My Valentine), Dave Mustaine (Megadeth), Rick Savage and Phil Collen (Def Leppard) and more. World Music Supply is proud to carry Jackson electric guitars. We offer a selection of their finest for beginners to professionals from the JS series, the MG Series, the Pro Series, and the X Series.